Trigger point injections refer to the injection of numbing medication into areas of the body that have persistent pain due to ‘muscle knots’. These injections can be done almost anywhere on the body, but certain urinary conditions may benefit as well. Trigger points are irritated areas within bands of tight muscle that feel like hard nodules when palpated. They are often referred to as either active or passive trigger points. Passive trigger points only hurt in the area of the nodule when palpated, but active trigger points cause referral of pain to another part of the body. Trigger points are associated with many types of conditions, such as headaches, ringing in the ears, pain in the jaw joint, and low back pain. They often occur with chronic musculoskeletal disorders and can lead to decreased range of motion in the muscles that are affected. Trigger points are caused by both acute trauma and repetitive microtrauma. Athletes with injuries due to acute sprain or repetitive stress—such as tennis elbow or golf shoulder—can develop trigger points, as well as individuals with surgical scars and postoperative tissue tension. Microtrauma can result from lack of exercise, poor posture, and joint problems, as well as repetitive occupational activities—such as holding a telephone receiver between the ear and shoulder or sitting in chairs with improper support for extended periods. Where do trigger points occur? The upper trapezius muscles on either side of the neck. The quadratus lumborum muscles of the low back. The hamstring muscles in the backs of the thighs. The calf muscles of the lower legs. Along the iliotibial band, which runs through the pelvis. Individuals who have excessive trigger points may experience chronic pain and develop myofascial pain syndrome. 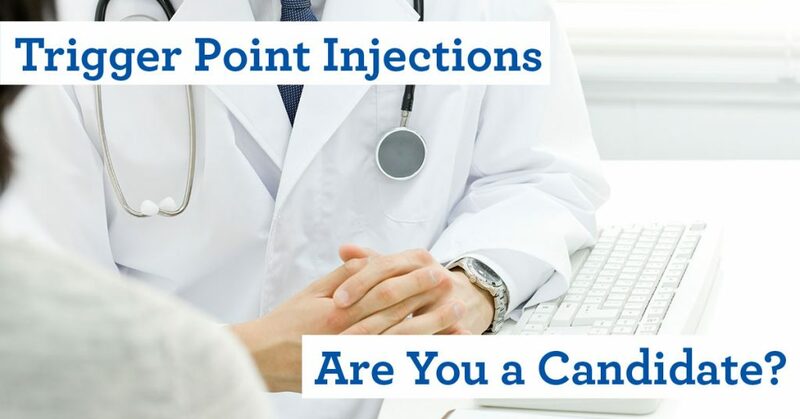 Trigger point injection (TPI): A healthcare provider inserts a needle into the trigger point and injects it with a local anesthetic or saline, and may include a corticosteroid. The injection inactivates the trigger point, which results in relief of pain. If a patient is unable to receive medication in the injection for some reason, a dry needle technique may be used, after which the muscle is gently stretched. TPI is performed in the office and usually only takes a few minutes. Spray and stretch: A cooling substance is sprayed onto the skin over the trigger point, which helps to relax the muscle so that it can then be gently stretched. Massage: Massaging the muscle that contains the trigger point and providing compression to the trigger point itself can help the muscle relax, which relieves pain. Physical therapy: A physical therapist can evaluate for causes of trigger points—such as poor posture—as well as provide guidance about specific exercises to help stretch the involved muscles to relieve pain. Medications: Anti-inflammatory medications and/or muscle relaxants are sometimes recommended, as well. Trigger points can lead to a ripple effect of problems if they are left untreated. If you are experiencing pain that you think may be related to trigger points, our experts can help. Contact us today. ©2019 Western Michigan Urological Associates. A Holland Hospital Physician Office.